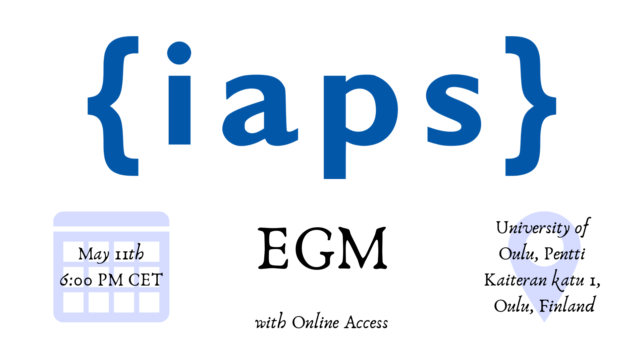 The Executive Committee, per IAPS Charter point 17.2, has called for an Extraordinary General Meeting (EGM) to be held on Saturday, May 11th 2019 at 6:00 PM CEST (Central European Summer Time, UTC+2) with physical location at the University of Oulu, Pentti Kaiteran katu 1, Oulu, Finland and online access. The main purpose is to determine who will carry on the PR Manager duties until the end of the current term, following the resignation of Sofia Ferreira Teixeira, and to review some of the main IAPS documents. Read the full provisional agenda below. If you have any questions, wish to attend the meeting remotely or want to propose other items to the agenda, write to president@iaps.info.